Who hates chocolate? Who hates anything that bad, to choose to completely abstain one hundred percent? It’s like, I don’t really care for cucumbers. It’s not that I dislike them, but they’re just kind of a pointless food, pretty flavorless, they’ve got those mushy seeds, the skin makes a squeaking noise on my teeth. Whenever I cook, I rarely use cucumbers. But if you give me a salad, I’m not going to go picking them out. I’ll just eat it. And besides, chocolate’s great, one of the shining achievements that defines us as a species. Doesn’t anybody remember second grade social studies? They talk about the Incas or the Aztecs, I can’t remember, but they figured out how to turn cacao into chocolate, it’s a pretty hard process, you have to separate the seeds, leave them to dry and ferment in the sun, crack them open and separate the solids from the oils. Who thought to do that? They attributed it as a gift from the gods. If God gave me a box of chocolates, I wouldn’t say, “No thanks G, I don’t like chocolate,” no, I’d learn to like chocolate. It’s great, dark chocolate, Milky Way bars, I like all chocolate, the way it melts in my mouth while providing the satisfaction of having eaten something of substance. If there’s one junk food that I could eat as a meal, it would definitely be chocolate. So I decided to see if my friend really didn’t like chocolate, or if he was just saying that he didn’t like chocolate. Like maybe it was one of those early repressed childhood memories, like he was enjoying some chocolate one day and then two seconds later he got bit a spider, and because he was so little, his brain couldn’t separate the two events, and he grew up convinced that chocolate was to blame, that he couldn’t explain why, but whenever he thought about eating chocolate, his skin started to tingle, like a hundred invisible tiny spiders were crawling across his skin. That made sense to me, my theory, and so I decided to help undo the damage. I bought a big bag of Skittles and poured them into a bowl. “Hey man,” I called him over, “I got Skittles.” He was like, “Thanks dude, I love Skittles,” and he started grabbing them by the handful and shoving them into his mouth. My plan was working. Unbeknownst to him, I had secretly mixed in a small amount of M&Ms. Just a few thrown in, just enough to make sure that he’d definitely eat at least one or two. And wouldn’t you know it? He didn’t say a word. Not at any point did he stop his chewing, roll his tongue around the inside of his mouth and say, “Hey Rob, are there any chocolates in these Skittles?” No, he finished the whole bowl. 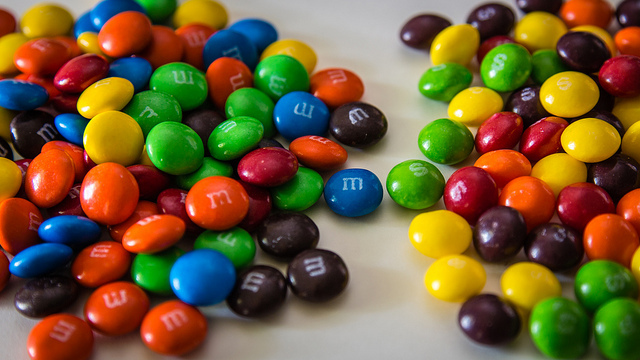 I figured I’d best stick with the plan for a while, gradually increasing the amount of M&Ms until there’d be no way for him to escape the reality that for however long I’d been providing him with free Skittles, he had been eating and enjoying the hidden M&Ms. I felt terrible. But I also felt vindicated. Because seriously, nobody hates chocolate. Chocolate’s delicious. A chocolate allergy, I guess it sounds possible. But my friend didn’t look like he was allergic to chocolate. Maybe he was mistaken about that also. “So, how are you feeling?” I asked him. And then he looked me right in the eye, and I couldn’t tell in that moment if he knew or not, if he even suspected that I’d been spiking his Skittles. But there was definite eye contact, for a moment, he saw into me, into my eyes, we were locked. I think he did figure it out, in that last second he knew just what I had been up to, but he couldn’t do anything about it, because he couldn’t spit out his words, he was struggling, choking. He raised a hand up in the air as if to accuse me, but then his other hand clutched his throat, and then he dropped dead, falling headfirst into the coffee table, right into that big bowl of half Skittles, half M&Ms. This entry was posted in Uncategorized and tagged chocolate, Friends, M&Ms, skittles, True Story on August 29, 2013 by Rob G..